Porthcawl is a town situated on the South Wales coast in Mid Glamorgan and is one of the most popular locations for surfing in Wales. 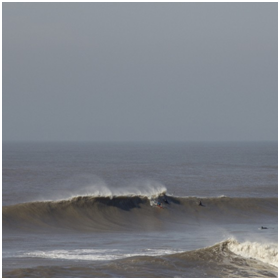 Surfing contests and events are often held at Porthcawl and it is around a 35 min drive down the M4 from Swansea and around 40 mins drive up the M4 from Cardiff. 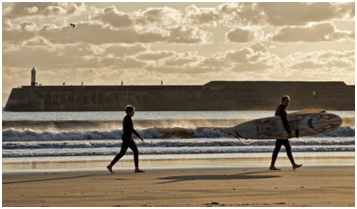 There are a number of great beaches (including Blue Flag awarded beaches) in and around the area and so we have gathered our hints and tips about some of the local surfing spots for you below. Rest Bay is a long Blue Flag beach on the west side of Porthcawl and is the most popular and consistent beach in the area for surfing. Most of the surf on this sandy beach comes from ground swell, the best swell angle is from the south west, and the breaks come from left to right. The best surfing conditions are when the wind is from the east. Not so good when onshore. Low tide is normally small but when there is a good swell it really is one of the best times to surf! Beware of the strong rip on the left hand side of the beach by the rocks, and note its best to stay in line with the lifeguard station (lifeguard cover May to September), especially on the incoming tide as you could get cut off by the rocks. Nearby to Rest Bay are a number of surf schools if you are a beginner or looking to brush up your skills, there are also toilets nearby and a cafe for refreshments. There is a Pay and Display car park at Rest Bay where charges apply and the postcode to find the car park is CF36 3UP. A sandy beach (also known as Sandy Bay) that is great for surfing newbies and the more experienced too. The harbour wall and pier helps to protect the beach from some of the stronger winds from the west, which makes it a good second option if the surf at other beaches becomes too choppy from onshore winds. There is lifeguard cover from May to September too. Coney beach is near to the amusement park, places to eat and nearby to toilets. Theres plenty of parking but please be aware that in the summer it can get very busy! Free parking on the Eastern Promenade but time restrictions may apply. The Hi Tide car park and Salt Lake car park charges apply but there is other pay and display parking nearby - postcodes to get you to the area are CF36 5BT or CF36 5TS. This beach (also known as Black Rock beach) on the east side of Porthcawl isn't the best for surfing. A rocky and sandy beach that is popular with jet skiers. This sandy and pebbly beach (also known as Dunraven Bay) has some interesting cliff formations and there is the Glamorgan Heritage Centre and the Dunraven Castle ruins and walled gardens close by. The beach is a bit exposed but the surf is quite consistent at all times of the year. 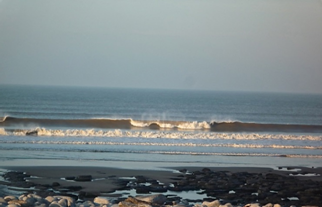 Southerndown is best for surfing in winter with beach breaks from both left and right, the ideal swell direction is from the south west. Popular with canoeists and surfers. Car park is next to the beach - fees apply - postcode for the car park is CF32 0TF. A popular beach in the summer but has an overflow car park a short walk away and there are toilets nearby. Please be aware that thieves may operate on the beaches. Dont hide your keys as you maybe being watched! We recommend using a waterproof case to keep your personal items safely with you. We have a variety of cases available such as the Aquapac which is 100% waterproof and goes around your neck under your wetsuit. Please also bear in mind that lifeguard cover will operate between particular hours depending on the beach, so check the station or look out for the lifeguard flag to be sure there is a lifeguard on duty.